When the trailer first came out for The Descendants, I was pretty unimpressed. I love George Clooney and Alexander Payne, so having the two working together should be something I immediately find brilliant. However, the trailer really didn’t do anything for me. It didn’t look like a movie I would enjoy. After reviews and reactions from its showings at the Toronto, Telluride and several other film festivals, I started to become intrigued. Many critics and movie fans I follow and usually agree with were dishing out heaps of praise for this film. I was surprised and couldn’t wait to see the film myself. And I must admit that The Descendants totally deserves all this praise because it actually is one of the best films of the year. 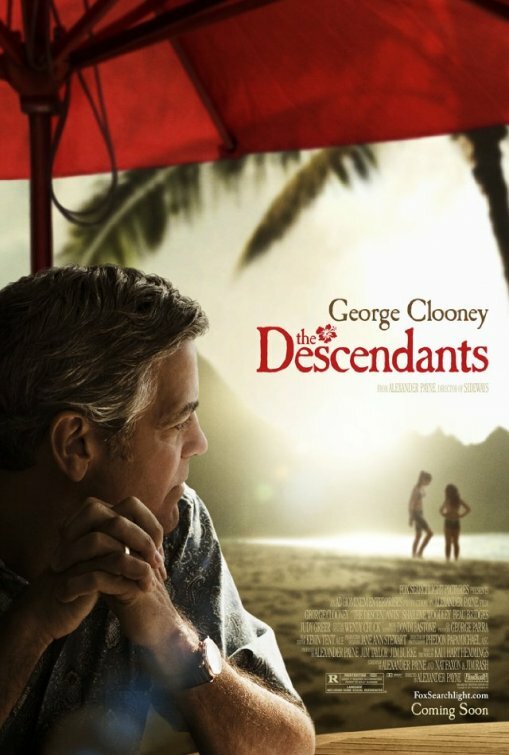 The Descendants follows Matthew King (George Clooney), a land baron, trying to cope with his wife, Elizabeth, in a coma and two difficult daughters. When his oldest daughter, Alexandra (Shailene Woodley) reveals that his wife was cheating on him, together they team up to find the guy she was cheating wit, in order to confront him. All the while, Matt must decide whether he should keep or sell a large amount of beautiful Hawaiian land that his family inherited. The Descendants is a family film. But not one you should take children to see. (There’s a ton of swearing.) It’s about a family, dealing with heartbreak and an impending loss of a loved one. They are far from perfect, and that’s what made them so interesting and relatable. Matthew spent a ton of time away from his kids, and when he’s left to take care of them, he is clueless. His youngest daughter, Scottie (Amara Miller), acts out and says stuff that is quite inappropriate for a 10-year-old. Alexandra is an angry 17-year-old, and past problems with alcohol and drugs are alluded to. Matthew finds himself in over his head, and when his wife’s indiscretion is revealed, it somehow miraculously brings his family closer. That’s what I find so crazy and awesome about this story. One thing that sets the story apart is its setting in Hawaii. We all envision Hawaii as one big resort. The audience is taught that real life happens in Hawaii. It’s not vacation 24/7. It taught a lot about the American culture and life there. The story of Matthew’s ancestors and how he became entrusted with such a beautiful piece of land is something I found interesting. The performances were excellent. George Clooney is at his best in this film. I can see him easily snatching up an Oscar nod for Best Actor. I was most impressed with Shailene Woodley though. I was vaguely familiar with her, since I watched a couple episodes of her ABC Family show, The Secret Life of the American Teenager. I found the show a bit too melodramatic for my tastes and stopped watching. But I assumed that Woodley didn’t have much talent. After seeing this movie, I’m a total idiot for assuming that because this girl has serious talent. All this time, she just needed some great material to show off what she can really do. The father-daughter chemistry between Clooney and Woodley was perfect. My favorite scenes were when the two of them teamed up. I definitely think that Woodley is contender for a Best Supporting Actress nomination. This is a different kind of film for Alexander Payne. It’s still comedic, but it deals with a lot with emotion. In my opinion, this is my favorite Alexander Payne film. Payne really delivered on those emotional scenes, and he laced those sad scenes with humor. At some points, I found myself laughing, but then felt bad for laughing. Yet, it’s still not awkward. He put together an excellent script, and I’m thinking he’ll snag a nomination for Adapted Screenplay. If like me, you didn’t like the trailer for The Descendants, don’t let that stop you from seeing it! The trailer doesn’t truly convey everything this movie is about; it’s really a film that is hard not to enjoy. As I said earlier, it’s one of the best films I’ve seen this year and one of the best family films ever made. The Descendants is now playing in New York and Los Angeles. It opens in more cities Friday, November 18th. To see when and where it’s playing near you, click here!